It’s been 5 days since Greece’s first World Cup match and my nerves still are not settled. The post-game, somber atmosphere of the donut-scented living room in Niko’s house is still fresh on my mind. Yes, donut-scented living room – because a Greek cannot simply show up to another Greek’s house without food, so for a game at 9:00 AM the result is 10 dozen donuts. So how can this team, that I grew to love during the qualifying stage, take a 3-0 beating? Going into the tournament I thought Greece would perform much better – in fact I knew they would perform much better. It can be argued that talent-wise, Greece has the best team in their group. So what gives? Regardless of what you read in the press or heard from your friend at the Kafeneo, the Greeks played well for the first two-thirds of the game against Columbia. Anyone who says differently is just a stubborn Greek who’s pissed off at he outcome. Sure, they were losing 2-0 by the 58th minute, but in all fairness, both of those goals were very lucky on Columbia’s part. Greece also had plenty of opportunities to score, but they just couldn’t finish. In the 63rd minute, Greek striker Fanis Gekas had a golden opportunity to cut the 2-goal deficit in half by burying a header into a wide-open net, but the ball ricocheted off the crossbar instead. I’m sure the attitude of the Greek team would have been very different for the remainder of the game if they were down only one goal instead of two. 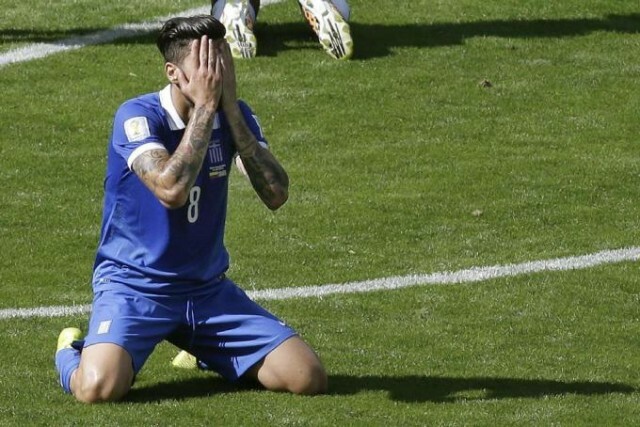 Panagiotis Kone and Vasilis Torosidis played exceptionally well, but it shows that they cannot carry the whole team by themselves – Greece’s forwards need to step up. The starting line-up is the biggest problem for this team. In my previous article I stated that one of the critical success factors for Greece was to unleash their fiercest weapon, Kostas Mitroglou, but he started the game on the bench against Columbia and wasn’t brought in until the 64th minute when Greece was already down 2-0. Even after he took the field, he seemed out of sync with his other teammates. He needs to be on the field from the very beginning so he can build some momentum and chemistry with his teammates. The biggest challenge a striker faces is being in the right place at the right time, and you can’t do that without knowing the tendencies of your teammates – and the only way that happens is by spending time on the field with them. Another critical success factor I wrote about was playing the more talented and faster young players – this too did not happen. Simply put, Greece ended the game with 37-year-old Giorgos Karagounis and 34-year-old Kostas Katsouranis on the field. Katsouranis was winded by the 60th minute and was jogging most of the second half, while a slower Karagounis replaced our best performing player, Panagiotis Kone. This was simply pointless. Greece must go with a younger starting line-up in order to have a chance to beat Japan. Lastly, Jose Cholebas was taken advantage of the entire game, and Columbia’s first goal was setup on the left side of the Greek defense where Cholebas plays. Although he plays as a defender for both his club team and national team, Cholebas’ more fitting role would be in the midfield. I still don’t understand why he’s a defender. Lots of media outlets are reporting that there was a lot of finger-pointing going on following the 3-0 loss to Columbia, including comments from Fernando Santos, the coach himself. How can the team expect to move forward from this loss when everyone is playing the blame game? Hopefully they can move beyond this as they prepare for Japan on Thursday. So where does Greece go from here? Just because Greece lost the first game does not mean they’re out, and they cannot afford to lose either of the two games against Japan and Cote d’Ivoire (Ivory Coast). We only have to go back two years to Euro Cup 2012 to see that Greece was able to move beyond the group stage with a loss and a tie in their first two games. But in order for Greece to advance to the next round, they need to seriously adjust their starting line-up. A loss against Japan all but confirms their elimination from the tournament. Here is the starting lineup from the game against Columbia, with each player’s respective age, and who I believe they need to be replaced by. Let’s put it this way, if you see Gekas in the starting line-up, then just turn off your television. There’s no reason why 34-year-old Gekas, who has been playing for 2nd division club teams in Turkey, is on the Greek National Team; while 25-year-old Stefanos Athanasiadis, who plays for PAOK and lead the Greek Superleague amongst Greeks in scoring last year, is at home watching the World Cup. Greece’s next game is against Japan on Thursday, June 19 at 6:00 PM EST. Greece has only faced Japan once before in the 2005 Confederations Cup, and they lost 1-0. Historically, Greece does not fare well against Asian teams; they have a record of 0 wins, 2 ties and 4 losses against the likes of Japan, Korea Republic and North Korea. But there’s a first time for everything, right?